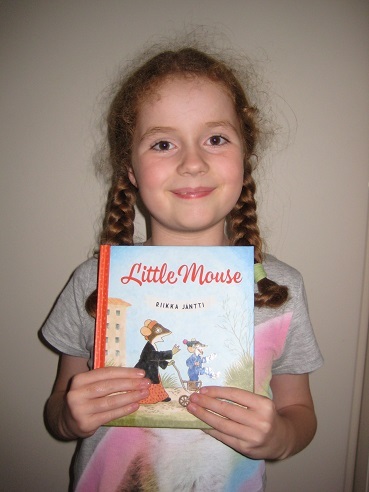 Readers with (very) good memories may remember that Hayley, the younger of my two little helpers, assisted me with a couple of reviews last year featuring a mischievous young rodent and his long-suffering mother. Well, we actually received a copy of the first book in that series a while back, but never got around to reviewing it (somehow it slipped through the blogging cracks…). Luckily, though, Hayley was inspired by her sister’s decision to get back to reviewing, and today she’s happy to report back on more mousey adventures. I wonder what he’s got up to this time? 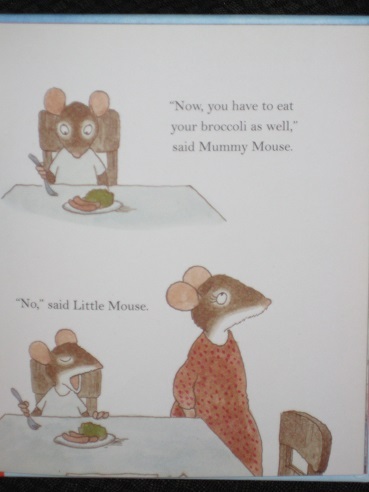 The book is called Little Mouse, and it’s written and illustrated by Riikka Jäntti (the translation is by Lotta Duvfa). In the morning Little Mouse felt happy, and then Mummy Mouse said it’s time to get dressed, but Little Mouse said no. And then Little Mouse tried to get dressed himself. I think he was a naughty boy in this book! Yes, because Mummy Mouse had to chase Little Mouse around the house. My favourite part was when he went to childcare, and he played and he had lunch (and a nap). Was it difficult to read? Yes, because they might think it’s funny. As mentioned above, this was actually the first of the three Little Mouse books that have made it into English so far (courtesy of Scribe Publications’ Scribble imprint), but the last one Hayley and I got to. Again, these books are probably meant for much younger children than my eight-year-old, but Hayley was happy enough to use this for reading practice and laugh along at the small rodent’s antics. At the end of the day, Mummy Mouse came to pick Little Mouse up. “Hi, Little Mouse. It’s time to go home,” she said. While it’s a nice enough book, Little Mouse is quite an easy read. In truth, I suspect that this wasn’t translator Lotta Duvfa’s most arduous job, and it is fairly repetitive at times. The next two books are a little more sophisticated, with a bit more of a plot and several nods and winks to the parents reading along. In many ways, I’m glad we read the others first, as we may have decided that this one was a little too easy and not gone on to the others. It’s very much an introductory book, with the pictures probably more impressive than the text.